SBTRKT is Aaron Jerome, a producer based in London. He performs behind a mask every time he plays out. 5 things about SBTRKT: 1) His live show includes his main collaborator Sampha on vocals and keyboards. 2) The name came about to create a musical identity separate from any single person. 3) Much of the music being played is electronic based but some recent material is live. 4) First gig was at fabric in Room 1 at Get Familiar (amazing sound/vibe!). 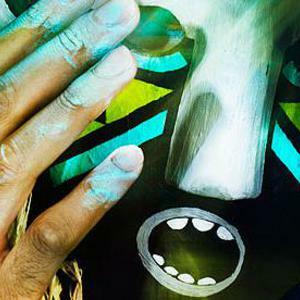 5) SBTRKT is pronouced 'Subtract'. 2) The name came about to create a musical identity separate from any single person. 3) Much of the music being played is electronic based but some recent material is live. 4) First gig was at fabric in Room 1 at Get Familiar (amazing sound/vibe!). 5) SBTRKT is pronouced 'Subtract'. Having just wrapped up remixes for Basement Jaxx (?Scars') and Franz Ferdinand (?Send Him Away'), he's got the airwaves in a stir with Benji B, Mary Anne Hobbs and Gilles Peterson singing his praises. With releases on the equally anonymous Brainmath label, Ramp and the ever fun Young Turks. "The main thing are the synths, arrangement and syncopation. I tend to play around with chords or pads first, and then start applying some drums to it. Even though I guess I write 'bass music' I tend to add bass in last; rhythm and arrangement are most important for me. A lot of people seem to mention '2 step' alongside my name guess it's just because of the syncopation that genre entailed."